Read two essays, one by an adult one by a your participant in Boston's CityReach program. This essay was written by Shannon Whitehead, an eighth grader, about her experience of the CityReach program that is part of Ecclesia Ministries. Shannon is a member of St. John the Evangelist, Hingham, Massachusetts. On the weekend of October 22, 1999, I had a religious experience that changed my outlook on life and made me realize how very fortunate I am. 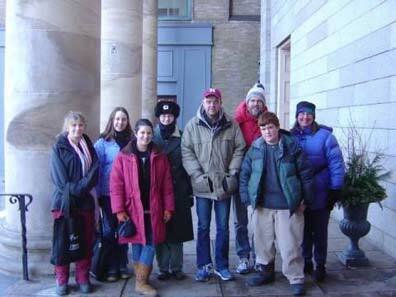 On Friday night, ten members of my Parish including myself, traveled to Boston to attend the 1999 CityReach. We met with six other church groups at the common cathedral on the Boston Common with an important goal, to give out as much clothing and food to the homeless as possible. It was a challenge we were anxious to tackle. When we had settled in at the cathedral, we met together in the church hall for an introduction to the weekend task and to listen to the stories of five homeless church volunteers. I learned many things in that hour, but one presentation stood out among all others: the story of, Matthew. He was the first to present, and everyone could tell he was extremely nervous. He paused for a few moments and then calmly, Matthew began to sing. His song told us not to close our doors to the homeless and that together we could all make a difference. The sound of his harmonica and voice brought tears to my eyes and at once made me aware of how very fortunate I am and how thankful I should be. That night, lying in my sleeping bag, I thought for the first time how lucky I was to be inside a warm church and not sleeping on the cold streets. The next morning, I awoke ready to help those who were less fortunate than I, and hopefully make a difference in their lives. After breakfast we at once began to sort clothing, make lunches, and prepare backpacks of supplies to distribute. We set up tables on the steps of the Cathedral where we placed hundreds of sweaters, pants, bags, blankets, etc., and we could already see the aisle of homeless people lining up to get whatever they might need. They stared at us with hungry eyes, anxiously waiting for us to let them in. Around 10 o'clock the chaos began. People rushed up to each table asking for a certain size or a certain piece of clothing. It gave me the greatest feeling when I could find the person exactly what he or she wanted. But my heart sank when they couldn't find the right size and had to walk away empty-handed. The majority of the people were very polite and grateful, others were drunk and pushy, grabbing a sweater right out of another person's hand in need of it. Later, a few of us broke up into groups to walk the streets of Boston and hand out lunches to people we saw on the streets. We also gave out clean socks and underwear and even a few sweatshirts. I knew the day had been a great success, and in giving someone just one piece of clothing, had possibly saved a life. I know I am an extremely lucky person, not only because I have a roof over my head, food to eat and clothes on my back, but because I was able to learn and take advantage of my experience at CityReach. I now know that many of the homeless people in Boston today are not on the streets because of alcohol and drug problems, but because a wrong turn was taken in their lives. I also now know that God has a plan and reason for everyone, and his plan may be to show us the eyes of Jesus through each of these homeless people. It is important to give to those who are not as fortunate as we are and to be grateful for everything we have. So the next time we want more clothes, or we want to see a movie or go on a vacation, we should all think of how little some people have. As Matthew said, You paid $7.50 to see 'Titanic,' but with that money you could have saved a life. We are the ones who can make that difference. 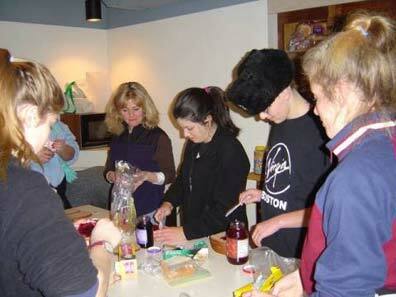 Last February, I went in to Boston with some other teens from my church to a program called CityReach. We went on night walks through the city with our guides, people who were either homeless or had been homeless. That night we slept in a church. 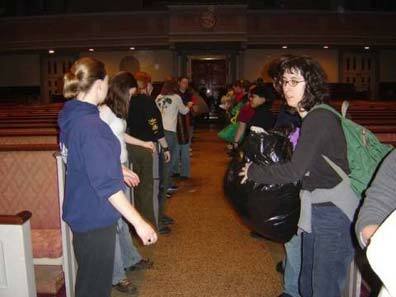 The next day we handed out warm clothing and food to Boston ’s homeless community. Later, when I found out that my church would be visiting common cathedral, I jumped at the opportunity to make good again. Common cathedral is run by Ecclesia Ministries, the same group that runs CityReach. Each Sunday, the homeless people of Boston and one visiting church group gather on the Boston Common for a worship service. When we first arrived, we were greeted warmly by The Rev. Kathy McAdams. When the service began, everyone gathered in a large circle. There were hymns, prayers, and Communion. I took the opportunity to help distribute Communion to everyone in the circle, and anyone who wanted to receive it outside the circle. After the conclusion of the service, my church group handed out sandwiches of all kinds to the people gathered. The amount of people lined up to get food was amazing and heartbreaking. The rule was one sandwich per person, but you could go and get back at the end of the line for another. We saw some people four, maybe five times. I remember one woman we saw probably six times, who was stuffing sandwiches into her messenger bag. She made me realize that this may be all her food for the next week. It truly broke my heart. These two experiences shattered any and every stereotype I have ever had of homeless people. Most of us seem to think of homeless people as people who are dirty, and scraggly, and shaking cups for money on the street corners; people who are only in the situation they are in because of things like drugs and alcohol. Yes, there are people like that, but not all of them are. I’ve seen people in suits who look very well-bathed and clean, and who are homeless. Not all of these people are addicts. Some may have just been in a bad situation, like a tragic death or rough divorce. Anyone can become homeless. And of those unfortunate people who do, I’ll always be here… making good.